Advanced Biometric Electronic Signature Pad with Backlight and Dual Serial/USB Interface. 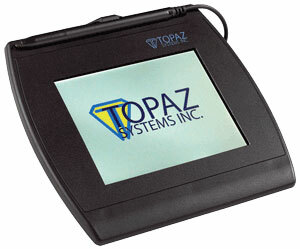 The Topaz SigGem Color 5.7 is an advanced biometric electronic signature pad with 5.7 inch, full-color TFT VGA (640 x 480) LCD that captures and displays "electronic ink" under the pen tip for a natural signature. Bundled secure software APIs provide for interactive text, graphics, and pen-tap hotspots and check boxes which enable users to navigate screens, read agreements, and select preferred options before signing. The Topaz T-LBK57GC-BHSB-R is also known as Topaz Systems	T-LBK57GC-BHSB-R	or TLBK57GCBHSBR	.